"Law is the last result of human wisdom acting upon human experience for the benefit of the public." 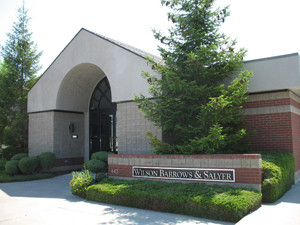 Wilson Barrows Salyer Jones is a general practice law firm serving northeastern Nevada. We accept many types of cases and transactions. If you desire to know whether we handle a particular type matter, please call, fax or email us. Wilson Barrows Salyer Jones is the successor to a firm founded by Orville R. Wilson (1910-1996) in 1945. Orville's son, Stewart R. Wilson, joined the firm in 1967 and Orville's son-in-law, Richard G. Barrows, joined in 1973. Rich Barrows' son-in-law, Robert M. Salyer, joined the firm in 1998 and the firm was pleased to add Shawn K. Jones in 2007.